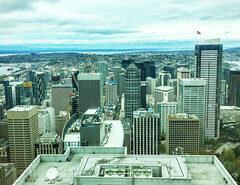 Seattle continues to grow and neighborhoods across the city are being impacted by dense construction. SDOT’s Access Seattle crews conduct reviews, in addition to regularly scheduled inspections, of construction sites to assess their impact on pedestrians, cyclists, and drivers. We work with contractors to maintain right-of-way code, enforce when necessary, and educate about the importance of accessibility for all. The Access team recently conducted a review of a construction site in Ballard and identified opportunities for improving mobility around the site. Inspectors worked with the contractor to provide cane-detectable surfaces around scaffolding in line with ADA standards, and to restore access to parking and the nearby parking kiosk by realigning the scaffolding on the sidewalk. As you can see in the photos below, these types of improvements make our city more navigable for all. Access Seattle’s end goals also received a boost of support this year with the implementation of a new SDOT Director’s Rule (DR). DR 10-2015, better known as the Director’s Rule for Pedestrian Mobility In and Around Work Zones, provides our inspectors with a clear framework with which to coach contractors on approved right-of-way practices. The rule prioritizes pedestrian access and makes sidewalk closures around work zones a last resort. The clear expectations outlined in this new rule allow pedestrians to navigate a more predictable city, and contractors to better understand what is expected of them when using the right of way. 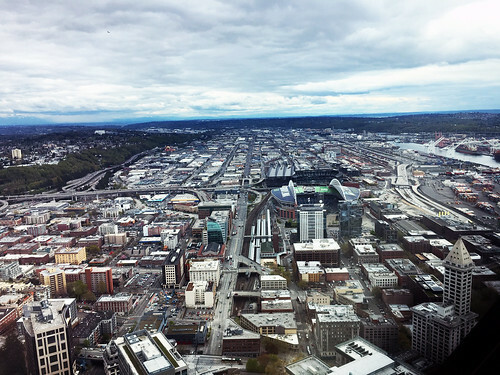 The Access Seattle team is constantly working to identify areas where public mobility and access can be improved. Do you have questions or comments regarding mobility and construction in your neighborhood? Please send the team an email at SDOTConstructionHub@Seattle.gov. SDOT crews have completed a new school crossing at N 80th St and 1st Ave N that provides a safer way for kids to cross the street to get to Greenwood Elementary School and St John Catholic School. 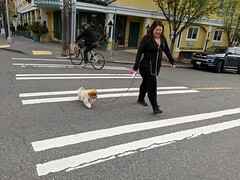 Improvements include a new curb bulb, curb ramps compliant with the Americans with Disabilities Act (ADA), marked crosswalks, and crossing beacons that flash when activated by pedestrians or bicyclists. The project also included adding an additional 20 MPH school zone flashing beacon on NW 80th St west of 8th Ave NW to slow down people driving through this intersection which is heavily used by Greenwood students. This improved crossing is part of the Safe Routes to School (SRTS) program, a national movement to make it easier and safer for students to walk and bike to school. The project also includes education and encouragement programs to get more kids walking and biking safely to school. The Safe Routes to School program was developed as part of Vision Zero, the City’s plan to end traffic deaths and serious injuries by 2030. Improving safety for school communities means building healthy places where kids can safely walk and bike to school and in their neighborhood. 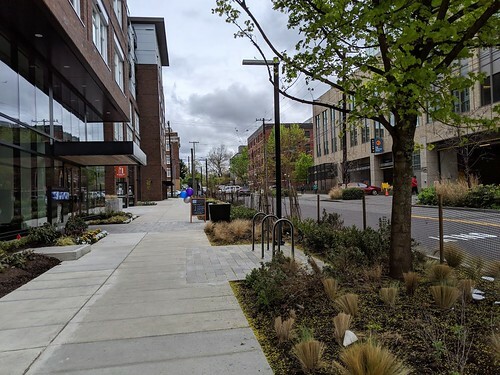 SDOT recently presented to the Northwest Universal Design Council on features that make an intersection accessible to all pedestrians. One topic was the complexity of curb ramp design, especially in Seattle where the hills and terrain can create some significant challenges. Curb ramp construction is not a simple process where a contractor simply builds a sloped ramp; it takes an engineer much time and effort to figure out how to build a ramp that meets design standards, and is usable to pedestrians while addressing potential site constraints. The first item that may be considered: what makes the most sense for curb ramp installation and crosswalk alignment at an existing intersection. Existing crossings that are generally parallel to the curb lines are shown in red. Due to the dramatic skew of the intersection, crossings would be very long. After review by a traffic engineer, a better location for curb ramps was found that would accommodate much shorter crossings, shown in green. Before design can begin, it is likely necessary for a surveyor to visit the location to provide dimensional information and identify any potential conflicts within the area, such as trees or utility structures. This information can then be put into computer aided-design (CAD), which provides a 3-dimensional image so the designer can begin planning the curb ramp. At this particular corner, the designer is faced with a number of challenges – the most daunting being the heavy roadway slope. Knowing the elevations of the curb, the designer can determine if it is possible to construct a ramp that satisfies all of the design criteria. If not, it is SDOT’s responsibility to construct a ramp that is accessible and usable to the maximum extent feasible (MEF). When the designer has determined the best possible design given the existing site conditions, the CAD drawing is completed, printed, and distributed to the contractor for construction. 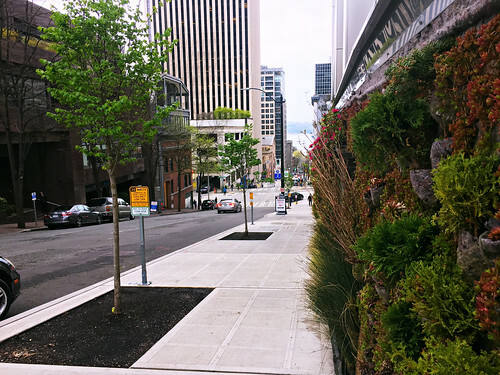 While there is no shortage of challenges when building curb ramps, SDOT, contractors, and the community work together to construct an accessible pedestrian network for all. 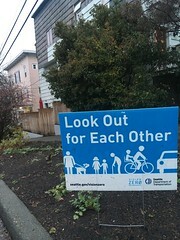 Four Seattle Neighborhoods improve Safety at busy intersections, Would You like yours to be next? 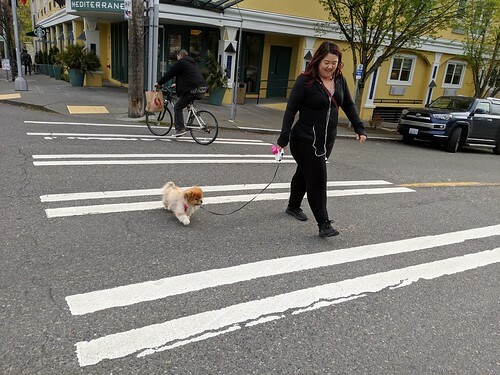 People living in and visiting four busy areas of Seattle can enjoy using intersections that are now easier and safer to navigate, thanks to the city’s successful Neighborhood Street Fund (NSF) program. Over the past year, crews working for the Seattle Department of Transportation (SDOT) have installed safety improvements at community-selected intersections in West Woodland, Lower Queen Anne, the Central District, and Capitol Hill. People walking, biking, or driving through these spots will find new curb extensions (or “bulbs”) and curb ramps that comply with the current standards of the Americans with Disabilities Act (ADA), new crosswalks, and signage. Near Ballard’s West Woodland Elementary School, the intersection at 3rd Ave NW, NW 56th St and NW 55th Pl is now safer for students and others who need to cross busy 3rd Ave NW. Before, the five-way intersection only had three stop signs and long pedestrian crossing distances. The new intersection features all-way stop signs, curb extensions, curb ramps, and marked crosswalks. In addition, NW 55th Pl was changed from a narrow, two-way street to a one-way southwest bound street. These improvements create safer crossings for people traveling through the intersection. In Lower Queen Anne, the Lake to Bay project on W Harrison St has brought safety enhancements to help the people who walk, bike, and drive through the intersections at 1st Ave W and 2nd Ave W. This project brought missing pedestrian amenities to part of the “Lake to Bay Loop,” which connects Lake Union to Elliott Bay through Uptown, Lower Queen Anne, South Lake Union, and Belltown. These intersection improvements also enhance the city’s Bicycle Master Plan. On 12th Ave on Capitol Hill, all four corners of the intersections at E Howell and E Olive streets have new curb extensions and ramps, as well as new marked crossings on 12th Ave at both intersections. These improvements make the roadway more predictable and improve access to nearby businesses and residences. 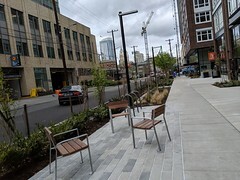 In the Central District, at the intersections of 19th Ave at E Union St and the E Pike St Stairs, people can now cross the street more easily, thanks to new curb extensions and ramps. In addition, later this spring, people crossing E Union St at 19th Ave can alert drivers that they’re trying to cross by activating new flashing crossing beacons. These projects began as ideas developed by the community and approved and ranked by their District Councils. The Bridging the Gap Oversight Committee selected twelve of the 39 Council-selected projects to be designed and built. 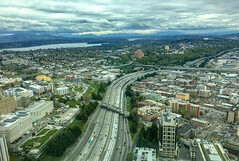 NSF funding came from the Bridging the Gap levy, which Seattle voters approved in 2006 and expired at the end of 2015. 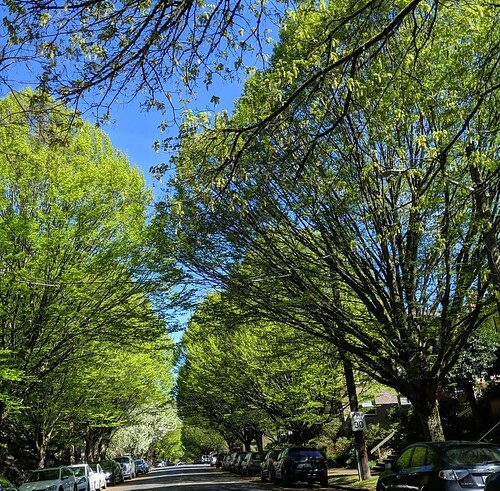 The voters’ approval of the Levy to Move Seattle last fall allows the city to continue the Neighborhood Street Fund (NSF) program over the next nine years. If you’d like to see similar improvements in your neighborhood, SDOT recently launched the next round of NSF applications that are due by April 17, 2016. 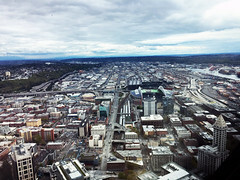 For more information, and access to the online application, please visit http://www.seattle.gov/transportation/nsf.htm. Good luck! In February, SDOT was joined by staff members from King County Metro to meet with a group of students at Seattle University to discuss accessibility of transit services as well as our public sidewalks and right-of-way for students with disabilities. It was a great opportunity to listen to the students ask questions and to express their concerns. 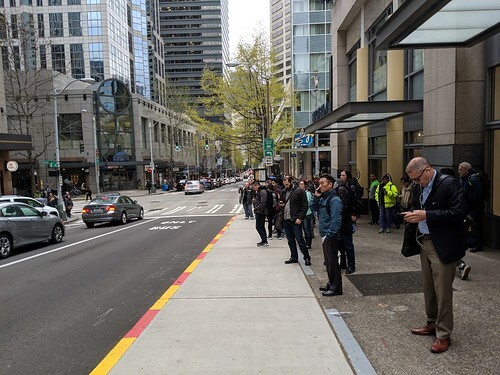 While King County Metro has their own responsibilities to make their busses and transit facilities accessible to people with disabilities, SDOT works to help make sidewalks and pedestrian connections to those facilities accessible, too. It is important to understand the needs of our pedestrians and our passengers alike, and it was very interesting to hear not only the questions but the recommendations that the students were willing to provide. The students noted that there are numerous challenges getting around campus and to transit facilities. 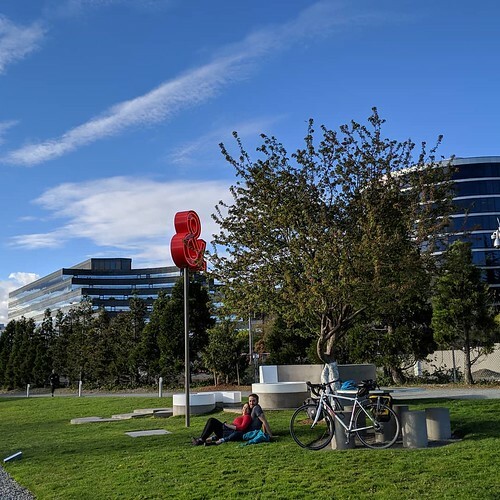 It was noted that there may be a need for the University to assess private walkways where they are located out of the public right-of-way, but further coordination between SDOT and Seattle University may needed. Some of the students had concerns of being visible to bus drivers and streetcar operators as well as boarding the vehicles safely. Other questions focused around construction and the provision of temporary routes in and around areas on campus. 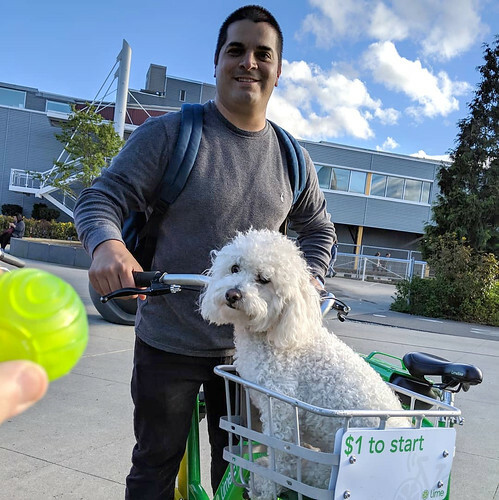 SDOT welcomes any opportunity to work with institutions like Seattle University or any other group that is willing to share to discuss concerns pertaining to accessibility within the public right-of-way. This interest in not limited to groups representing people with disabilities. Elderly pedestrians, pedestrians with particular abilities or needs, or anyone interested in sharing with SDOT should be comfortable in doing so, whether a group or an individual. Seattle’s construction boom is showing no signs of slowing down – but neither is our team of Access Seattle construction Hub coordinators! Every day, our Hub inspectors head out to construction sites all around the city to make sure that pedestrian, cyclist, and driver mobility is maintained, even in areas of the densest construction. For example, last week our inspectors found that a key pedestrian reroute along the waterfront was being blocked by fencing associated with a nearby construction project. Our team of inspectors worked with the contractor to quickly reopen the pedestrian pathway and, almost immediately, people resumed travel along this path that links popular areas of the waterfront. 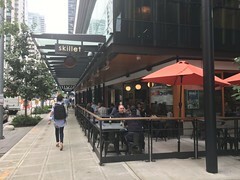 Earlier this week, our inspectors also worked with a contractor in the South Lake Union neighborhood to improve conditions for pedestrians around their construction site. 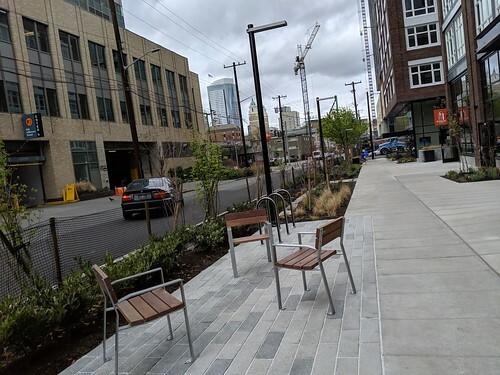 In particular, the Hub team worked to improve ADA accessibility by coordinating the installation of a cane-detectable kickboard along the scaffolding abutting the sidewalk, as well as the pouring of a concrete pad to make the sidewalk’s edge continuous. If you live in one of our current construction Hub districts—Downtown, South Lake Union, Pioneer Square, or Capitol Hill—and you have a question about construction impacts, please email the team SDOTConstructionHub@seattle.gov. Ballard Neighborhood Greenway Welcomes Walking and Biking! Thanks to progress on the Ballard Neighborhood Greenway Project, walking and biking along 17th Ave NW are becoming easier and safer. Greenway projects make small improvements on residential streets that add up to a big difference. 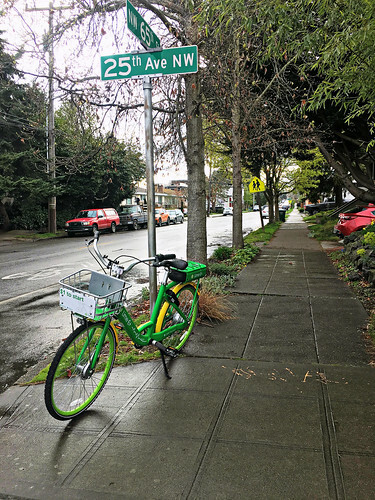 SDOT is developing a citywide network of neighborhood greenways to provide routes that are safer and more comfortable for people of all ages and abilities to walk, utilize and ride bikes on. This Blog post has inspired me to take my bike for a ride after I get home! New curb ramps and crosswalk at Soundview Playfield (NW 90th St). Curb extensions: Also known as curb “bulbs,” curb extensions help shorten crossing distances for pedestrians and improve visibility between people walking and driving. Curb ramps: New curb ramps that are compliant with current Americans with Disabilities Act (ADA) standards improve accessibility for all users. Crosswalks: New crosswalks provide increased visibility and safety for people crossing the street. Crossing beacons: These are pedestrian-activated signals that flash to alert vehicles that a person is crossing the street. New curb extensions, curb ramps, crosswalks, and crossing beacons at 17th Ave NW and NW 85th St.
Intersection at 17th Ave NW and NW 65th St, before and after, with new curb ramps, curb extensions, and crossing beacons. 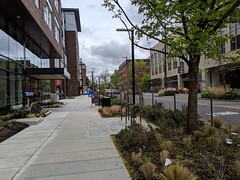 SDOT partnered with Seattle Public Utilities on a project to build natural drainage systems and neighborhood greenway improvements on 17th Ave NW between NW 83rd and NW 77th streets. To minimize construction impacts, the permanent greenway improvements will be installed as part of SPU’s natural drainage project in the spring of 2016. SDOT installed temporary improvements at the intersection of 17th Ave NW and NW 80th St, including striping and flexible bollards. 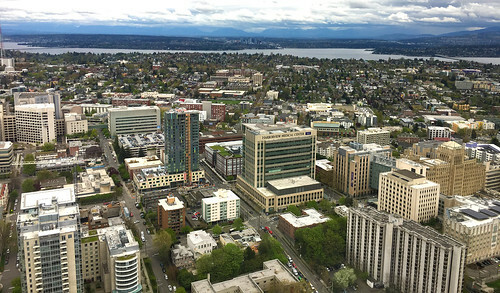 SPU will notify neighbors in advance of the start of construction. For more information about SPU’s work, visit the project webpage at www.seattle.gov/cso/Ballard, or contact Grace Manzano at (206) 233-5134 or grace.manzano@seattle.gov. 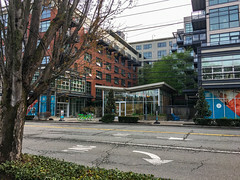 Also as part of the Ballard Neighborhood Greenway Project, a new public space was created at the intersection of 17th Ave NW and NW Dock Pl. Groundswell NW will work with the community to develop a permanent park within the new public space using Neighborhood Park and Street funds. 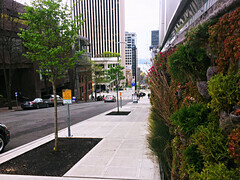 17th Ave NW and NW Dock Pl – location of new public space to be developed by Groundswell NW. More information on the Seattle Neighborhood Greenways Program can be found here.